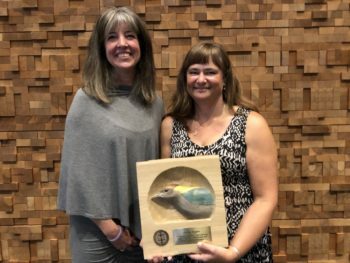 Partners in Flight (PIF) Awards recognize exceptional contributions to the field of landbird conservation, in the categories of leadership, investigations, public awareness, stewardship, and lifetime achievement. 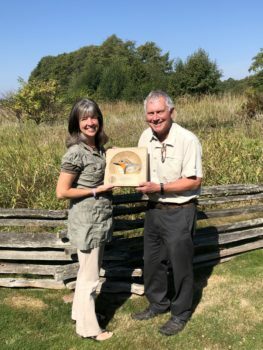 We are pleased to announce the final two 2017 PIF Award winners, who were recognized at the 27th International Ornithological Congress (IOC) in Vancouver, British Columbia, on August 21, 2018. 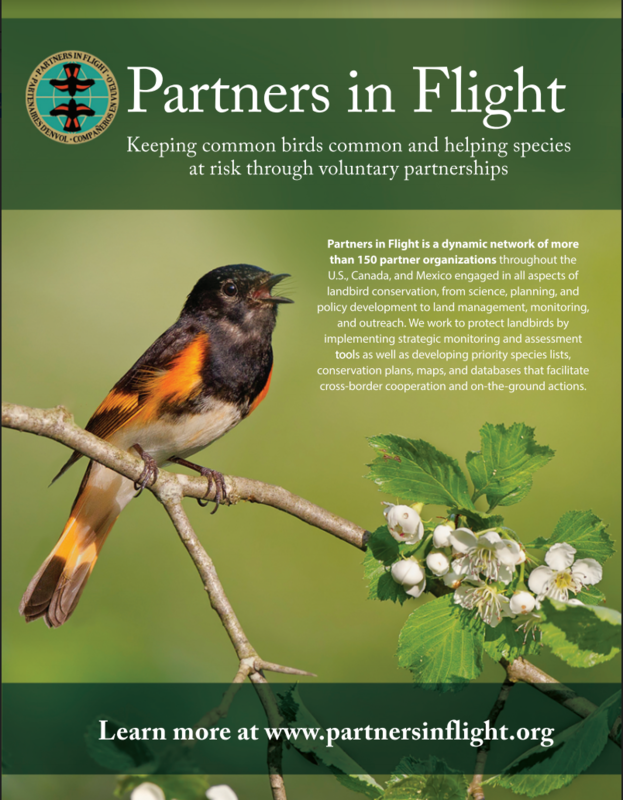 Five additional 2017 PIF Awards were presented in association with the March 2018 Partners in Flight Steering Committee meeting and North American Wildlife and Natural Resources Conference in Virginia. Nicola Koper (right) accepted her 2017 PIF Public Awareness Award at the 27th International Ornithological Congress. Also pictured is Wendy Easton. NICOLA (NICKY) KOPER received an individual PIF Public Awareness Award for her work in bringing birds and people together, linking avian science, monitoring and conservation with Grenadian communities. Nicky, a full professor in the Natural Resources Institute at the University of Manitoba in Canada, initiated the first systematic landbird banding program in the Caribbean nation of Grenada over four years ago. Since then the project has grown steadily in scope, innovation and impact and is now of significant value to Grenada, integrating local communities into the bird surveys, along with outreach and educational opportunities. Robert Elner accepted his 2017 PIF Leadership Award at the 27th International Ornithological Congress. Also pictured is Wendy Easton. ROBERT (BOB) ELNER, coincidentally The Convener of the 27th IOC, received an individual PIF Leadership Award for his outstanding guidance and leadership to build the scientific foundation and advance the conservation of migratory birds in Canada and along the flyways of the Western Hemisphere. In his role as the Research Manager at the Canadian Wildlife Service, Bob launched the inaugural meeting of PIF in Canada in 1998 and started Canada’s first PIF program in British Columbia. Soon after, he supported Canada’s first full-time regional PIF coordinator, a position that still exists today as Canada’s only permanent PIF position. 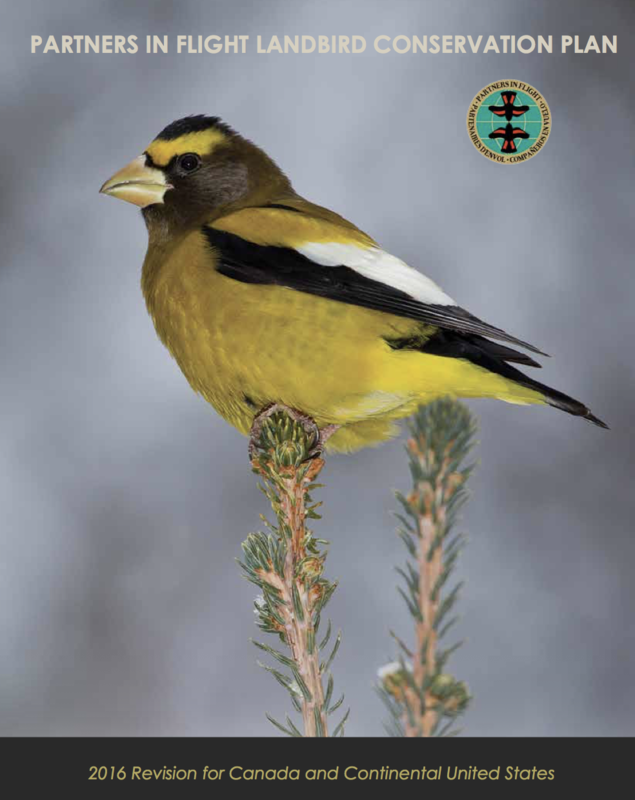 This program developed Canada’s first Bird Conservation Region (BCR) plan in 2003, a forerunner and template for the nation’s wall to wall BCR plans developed for all birds a decade later.